"We believe Ethernet is the future of commercial broadband and are excited to be in a position where we can help our carriers determine where to best spend their build-out dollars, since we'll know where the demand is." Screen shot of the GeoQuote Ethernet look up tool as seen by a Telarus agent. Using a graphical interface provided by Google maps, agents can see exactly where Lit Buildings are located - vastly reducing the research time required to provide quotes to prospective clients. DRAPER, Utah - August 8, 2007 - Telarus today announced the launch of a new marketing web site that focuses on businesses looking for fast (100 mbps) and gigabit (1 gbps) Ethernet broadband availability: www.ShopforEthernet.com. 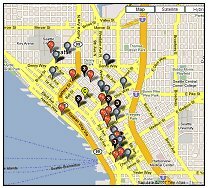 The web site, powered by GeoQuote and Google maps, enables the general public to search for lit buildings where broadband carriers have a physical presence. The results are displayed on a dynamically generated map for easy viewing. "We are very excited about the launch of ShopforEthernet.com," commented Adam Edwards, president of Telarus. "Giving the public visibility into the location of telecommunications equipment is a major advance in this industry, which has traditionally kept this information very close to the vest." Finding "lit" buildings where Ethernet broadband is available is very important to larger companies with high bandwidth requirements. By plugging in directly to a telecommunications carrier via Ethernet, customers avoid the expensive loop charges assessed by the local phone company. Speeds up to 10 gigabits per second are possible using Ethernet technology, with plans to increase that to 40 gbps. According to Infonetics Research, the market for managed Ethernet services is expected to grow by 30% per year until 2010, when it will top $25 billion worldwide. "Ethernet is the future of commercial broadband," added Lance Akins, VP of Sales for Telarus. "Helping our agents find the buildings where coveted Ethernet services are available is our primary goal. It benefits the users and carriers together, since the cost per meg is lower to the end user, and the margin is much higher for the service provider - all without the local Bell in the middle of the relationship." move into a building with existing carrier facilities. substantially upgrade their current broadband connections. establish a direct relationship with a provider without the local Bell in the equation. find a carrier who provides QoS (Quality of Service) guarantees. gather information that will be helpful in the planning stages of broadband deployment for a new real-estate development. The initial roster of service providers who have supplied the information necessary for inclusion in the GeoQuote Ethernet tool include Cavalier, Telnes, Level3, MegaPath, Time Warner Telecom, and XO Communications. To protect the proprietary and trade secret information provided by these carriers, the GeoQuote Ethernet lookup tool runs in "carrier agnostic mode" on the public www.ShopforEthernet.com web site. This means that no carrier Lit Building information is accessible to the general public at any time. However, the authorized Telarus sales agent who ends up working with prospects (who enter their information into the web site) have total access to carrier data. This enables agents to drastically shorten the time it takes to research carrier offerings, not to mention reducing the amount of wasted time carriers spend researching opportunities that just don't exist. "It took our team of programmers and research staff a significant amount of time to pull this project together," commented Andrew Morgan, VP of Web Development. "Judging from the potential attention this tool will surely bring Telarus and the emerging technologies of fast (100 mbps) and gigabit (1 gbps) Ethernet broadband, I'd say the investment will yield huge dividends to our agents and carriers." "We believe Ethernet is the future of commercial broadband and are excited to be in a position where we can help our carriers determine where to best spend their build-out dollars, since we'll know where the demand is" concluded Mr. Edwards. Telarus is a premier master agency whose goal is to make agents more successful than they can be on their own or with any other master agency. Telarus provides agent tools, automation, and superior support in an atmosphere of cooperation and ethical community. One example of the tools Telarus provides its agents is real-time voice and data price quoting through its patent-pending GeoQuote technology. GeoQuote makes it possible for business shoppers to access instant pricing and availability information for over 30 broadband data and voice service providers which include ACC Business, AireSpring, AT&T, Cavalier, Covad, Level3, MegaPath, Network Innovations, NewEdge Networks, Nuvox, PAETEC, One Communications, PowerNet Global, Qwest, TelePacific, Telnes, Time Warner Telecom, UCN, and XO Communications. If you are interested in selling Ethernet services through XO, Level3, Telnes, Cavalier, Time Warner Telecom, and more using the GeoQuote Ethernet plotting tool, please contact Thomas Hernandez at (888) 806-5459 for further information. All press inquiries should be directed to Patrick Oborn at (801) 938-3701.